A Ban on Dirty Shipping Fuel Is Coming. So Why Are Prices Surging? The cold beer will flow as usual, but for the thousands of energy traders, utility executives and analysts descending on Essen and the E-world fair in Germany this week the impact of a relatively mild winter on the power and gas markets will be a main topic of conversation. The warmer-than-usual temperatures for most of the heating season so far, along with concern about climate change, is scrambling the fortunes of utilities across the region and rippling through natural gas and power markets. While the weather has depressed demand, reducing the price of the fuels used to generate electricity, it’s also sharpened the focus of policy makers on acting against global warming. Most of the markets servicing utilities and their clients opened the year on a bearish note. That’s a reversal from the main trends of 2018, when benchmark German power prices jumped the most on record and carbon emission futures tripled. From the region’s renewable energy expansion to the trend of phasing out coal, the changes is upending the strategies of utilities from RWE AG to Uniper SE. It’s bolstering companies that haul liquefied natural gas, including Royal Dutch Shell Plc and Total SA. The following charts illustrate the themes on the minds of company executives and traders as they arrive on Tuesday at the giant Messe Essen center in the heart of the Ruhr region. Politicians led by Deputy Economy Minister Thomas Bareiss speak there on Monday. The chart above shows Europe’s gas storage levels through the last year. After a cold snap at the end of last February, gas traders spent the summer struggling to refill storage tanks depleted by the end-of-season jump in demand. Even at the start of September, stocks were lower than the five-year average, and the industry was bracing for upward price spikes. But autumn started slowly, with warmer than usual weather through October. The green line on the chart below shows the 30-year average for temperatures in Northwest Europe, while the yellow one indicates the actual reading. 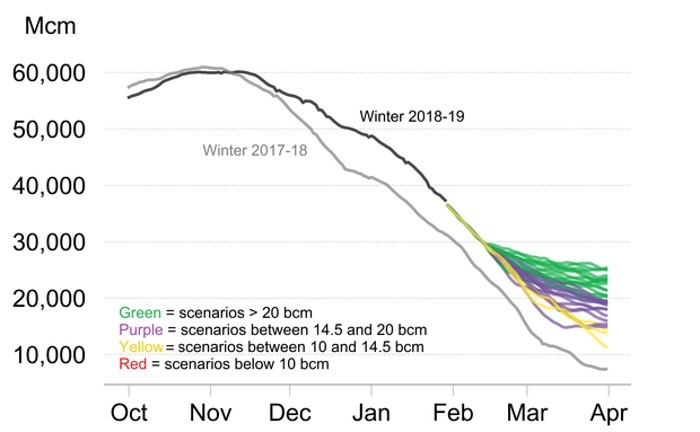 Through most of this year’s peak-demand season, temperatures have either been above or close to normal. The result: gas prices have eased back closer to their average for the season after running at their strongest in more than five years through 2018. Gas for delivery in March, when winter ends for the traders, is close to costs in April, indicating supplies are abundant enough that no last minute cold snap will leave a shortage. 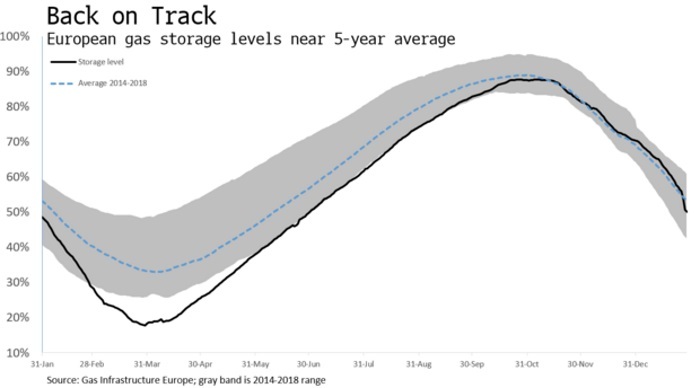 The chart below from BloombergNEF shows estimates for where storage levels will end the season, with all of them pointing toward higher levels than last year. Another factor is also weighing on gas at the moment. A slump in China has pared back demand for power generation fuels there, reducing the cost of both coal and liquefied natural gas. That’s meant that cargoes of LNG that previously were earmarked for Asia now are landing in Europe. 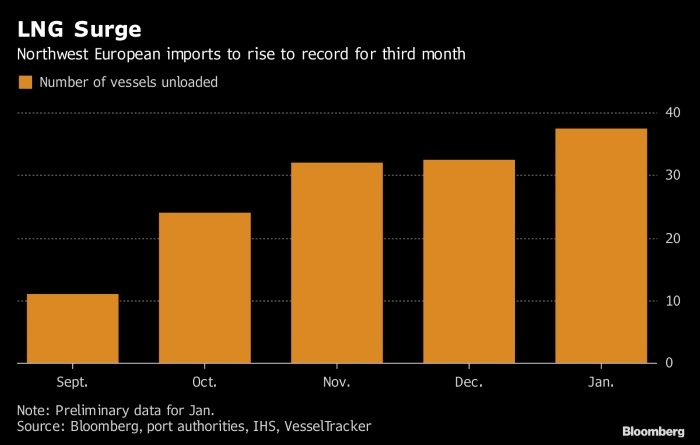 The chart below shows volumes of LNG injected into Europe’s gas grid, adding to near-record supplies arriving by pipeline. 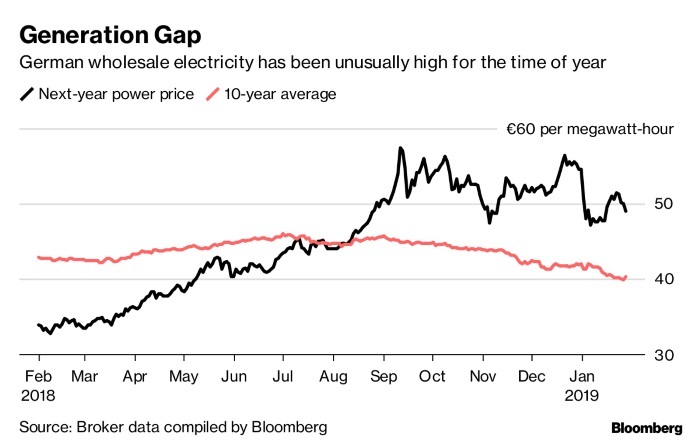 While the short term impact of warmer weather is for lower prices, the cost of generating electricity especially in Germany is headed up. Policy makers there set out a plan in January to close all power plants using coal by 2038, with some shutting early in the next decade. The chart below shows how that’s pushed up German prices along with the jump in carbon permits. But perhaps the biggest uncertainty facing the energy industry is where the carbon price is headed. Costs have surged for pollution allowances that factories and utilities must buy to cover carbon dioxide emissions. The gains followed a European Union effort to reduce a supply glut, reining in government auctions for the securities. While hedge funds think that trend has further to run, Germany’s coal exit raises new questions. Fewer coal plants would reduce demand for emission allowances in the coming years. The government said it’s likely to respond by cutting the amount of permits it’s auctioning. Exactly how ministers balance that effort will feed through directly to the price of certificates. 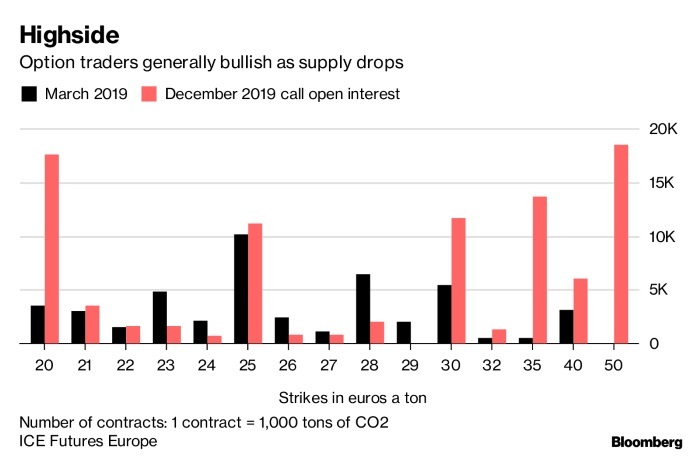 The chart below shows bets carbon traders are making in options markets indicating where they see prices headed.